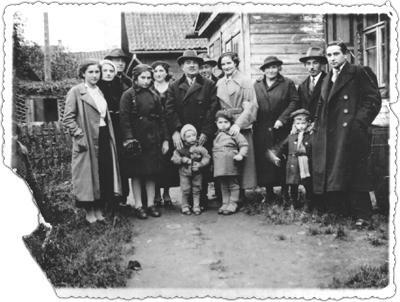 Holocaust Survivors: Photo Gallery - "Zitler Family, Vilna, 1936"
Zitler family, Vilna, 1936. Left to right: Doba Zitler Lewin, Shep's youngest sister; Sonia Zitler Morgenstern, Shep's oldest sister; Professor Michael (Micha) Morgenstern, Sonia's husband; Tzerna Morgenstern, their daughter; Rivka Zitler Podolski, Shep's sister; Asher Zitler,Shep's father; Hershel Morgenstern, son of Sonia and Michael; Mr. Podolski, Rivka's husband; Rachel Zitler, Shep's sister who was going to Palestine, providing the occasion for the taking of this photograph; Motele Podolski, son of Rivka; Bertha Cohen Zitler, Shep's mother; Meyer (Meier), Shep's cousin; Leib, Meyer's son; Shep Zitler at age 19 years. Not shown: Benjamin Zitler, Shep's oldest brother already in Palestine.